I love Movies based in New York and this movie appealed to me when I saw it on Netflix. Although it’s not for instant watch, it’s available on DVD. 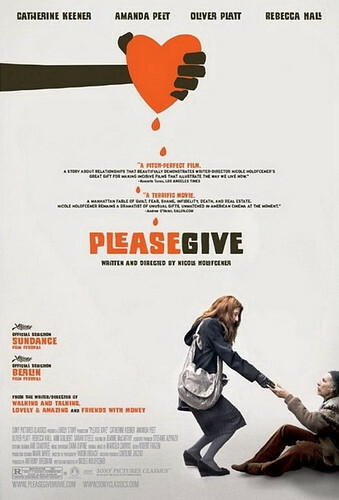 Please give is about a movie about this wealthy New York family who run a pretty unusual business. Alex (Olive Patt) and Kate (Catherine Keener) own a furniture business. They buy off furniture from families who have lost their loved ones and want to give away the furniture. Alex and Kate identify furniture that have huge potential and sell it off at a record cost! Pretty easy right? Kate is guilty about doing this and hence is looking for ways to give back. They also want to expand their own house but they have to deal with Andra (Ann Morgan Guilbert), a cranky 95 year old woman and her granddaughters, Mary (Amanda Peet) and Rebecca (Rebecca Hall). I like the fact that the movie has a nice flow to it and it ends in a very unlikely way. The characters just move on with their lives. It’s similar to Friends with Money (2006), made by the same director (Nicole Holofcener). I liked where the movie was heading but I felt like they should have resolved their issues. A good one-time watch though. Oh God it’s just so sad! The old lady, if you know what I mean. Does she ever even go outside?